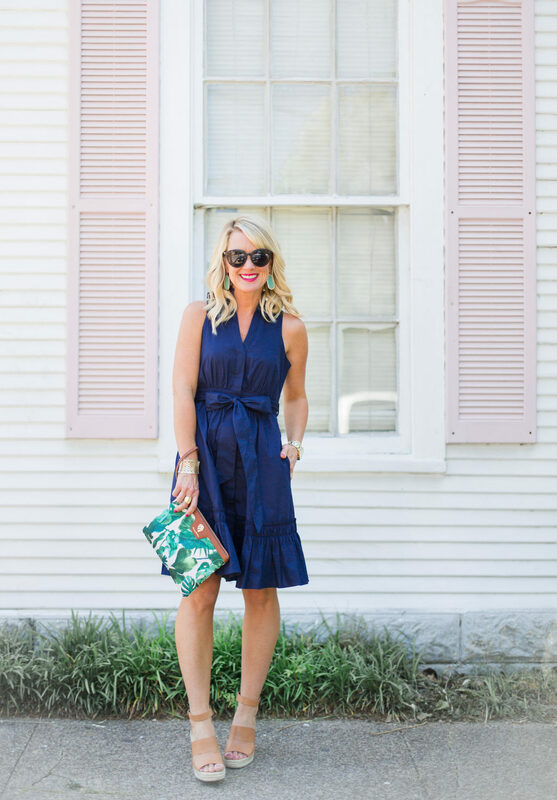 Work to Weekend | Navy Shirtdress | hi Sugarplum! Well this Monday sure rolled around quickly, don’t you think?! How was your weekend? Did you celebrate Cinco de Mayo? You know I’m always game to partake in tacos! 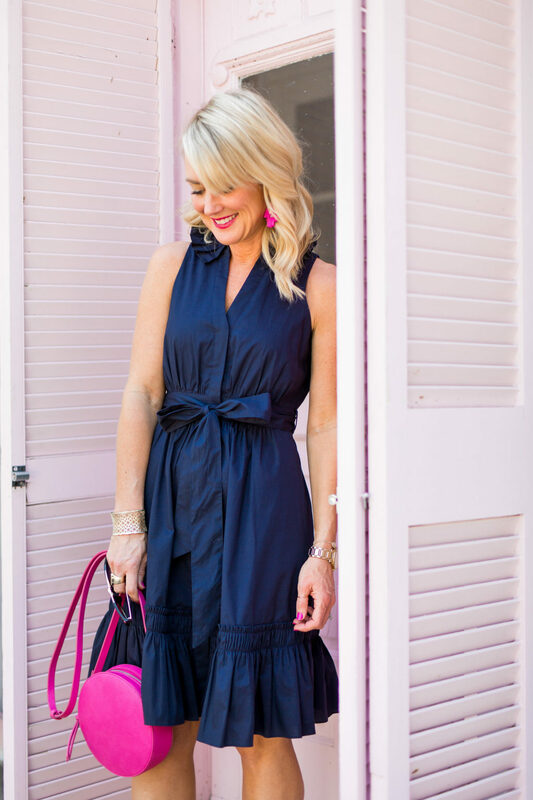 Today I’ve got a sassy new Work to Weekend for you, featuring the cutest tie-waist shirtdress, and more fun baubles from Kendra Scott’s new Summer Collection. I mean seriously, I want all the pink tassels she has to offer! I actually had the pleasure of hearing Kendra Scott speak at a conference last month, and she was incredibly inspiring. Not to mention, extremely genuine and likable. She started by selling her handmade pieces store-to-store, and ran operations out of her dining room with just the help of her mom! Kindness and giving back are at the root of everything she does, and the backbone of her company. Isn’t it amazing when good things happen to good people?! Not to mention, she makes gorgeous everyday and statement jewels! I shared this shirtdress in a previous Dressing Room Diaries, and couldn’t resist taking it home. 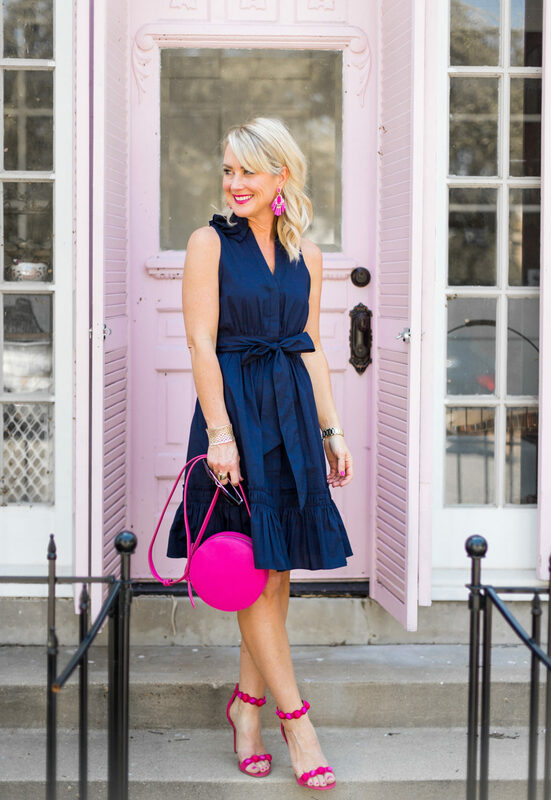 It has all the qualities I love in a dress…fit-and-flare shape, feminine details, and pockets! You can’t see it very well in my pics (I forgot a hair-tie! ), but it has the cutest pleated collar. 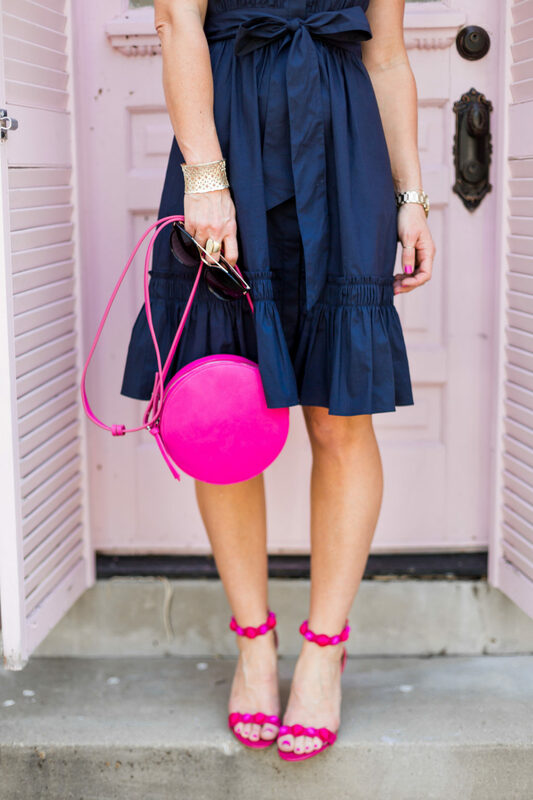 The navy pairs well with so many colors, but of course I always opt for pink first! 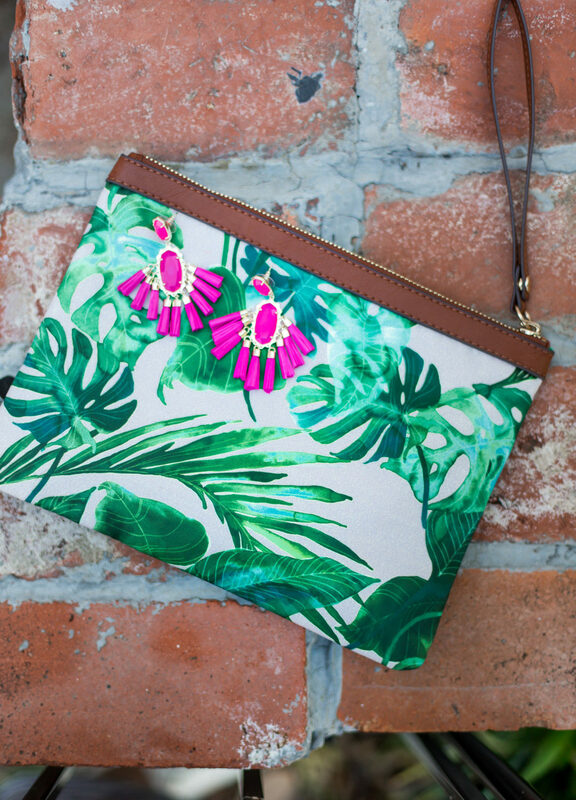 These earrings make a statement, but thanks to the raffia fringe, they’re super lightweight. Fit Tip: The dress is true to size, and I’m wearing a 0. Petite sizing is available (as are other colors! ), if you prefer a shorter length. Fit Tip: I sized up half in these sandals for more wiggle room in the ankle strap. For a more casual twist, I swapped the heels for my go-to wedges for a comfy weekend option. 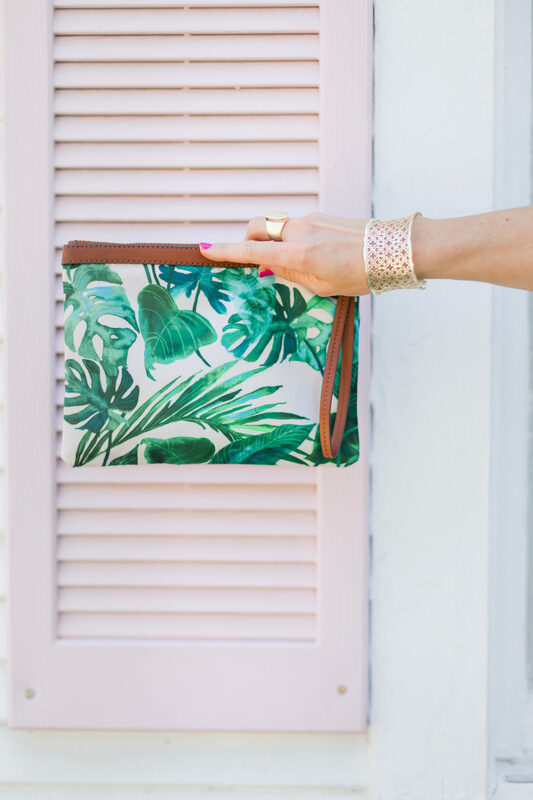 This palm print clutch is perfect for Summer, and even waterproof for pool-side use. 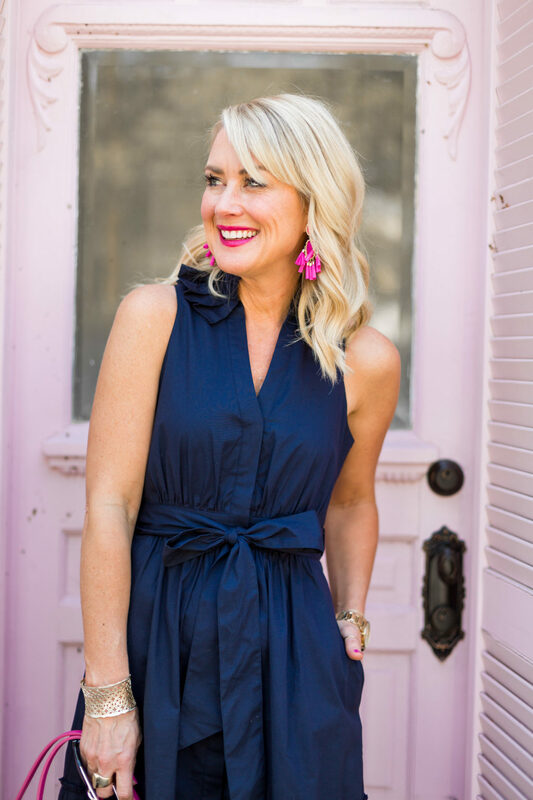 Funny enough, these large drop earrings were my very first Kendra Scott purchase…and have proven to be incredibly versatile over the years. This shade of pale blue/green acts as a neutral, and goes with so many colors. 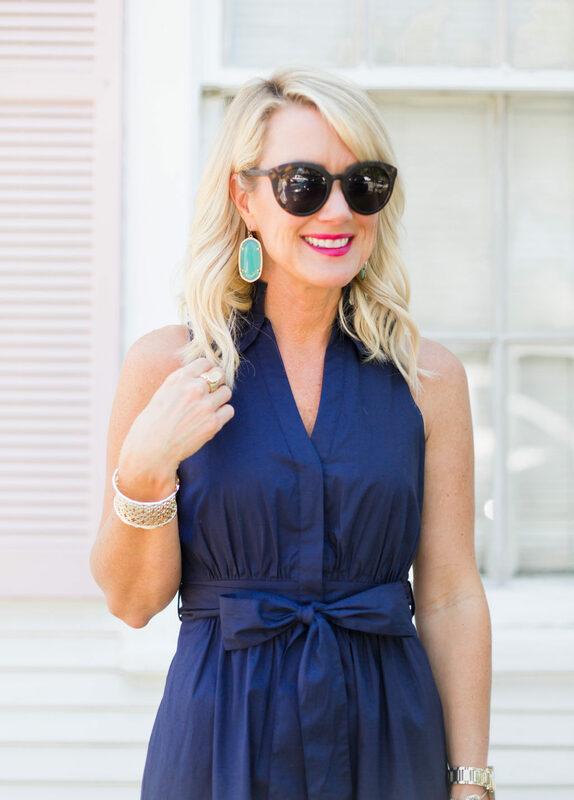 I’ve worn this dress countless times already…it’s even cute with these flat sandals and a jean jacket. 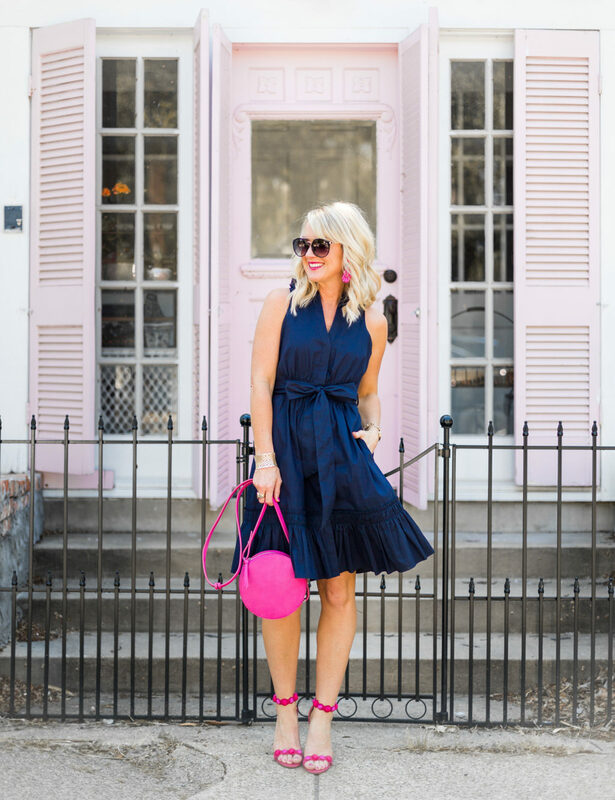 I love a good versatile dress for all my Spring and Summer occasions! Are you a sucker for the fit-and-flare, too, or do you prefer a different silhouette? Find more Spring Styles here, and Work Wear styles here. YES! Kendra was such an inspiration and so down to earth at the same time. I was so inspired by her GIVE BACK mission, but can we talk about her skin? LUMINOUS. I’ve created quite the little collection for myself of her jewels over the years, and her pieces from 4-5 years ago are still in constant rotation for me. Great photos w/the pink backgrounds-so creative. 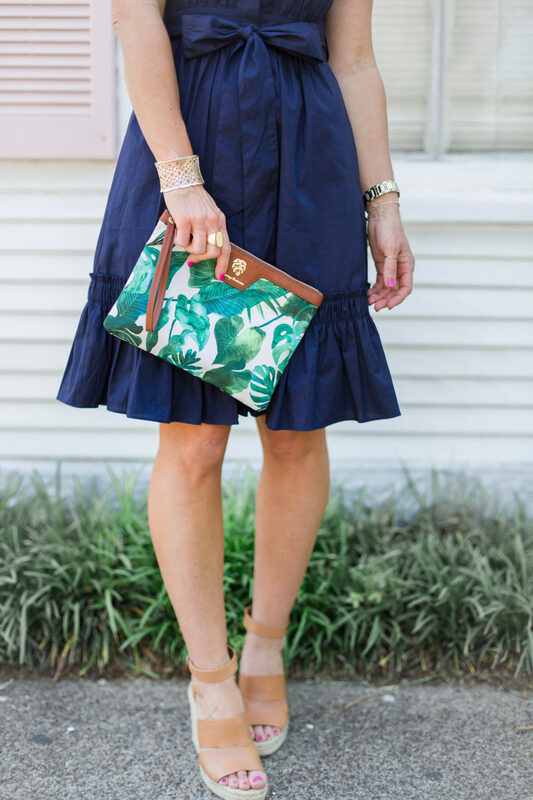 The palm leaf clutch-I would do everything fabric in my house w/that pattern. Even the dog bed. So fresh! I appreciate all the hard work you do with your outfit and dressing room diaries. I’d love to hear how you choose what actually follows you home (well, you do love a ruffle!). Is it the ability to wear it many different ways? That it photographs well? 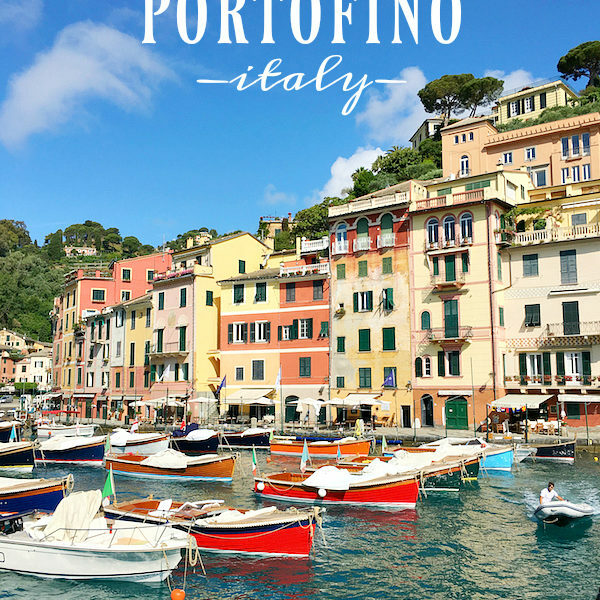 Works with clothes you already have in your admittedly fabulous closet? Fills a current need? Updates your look for a new season? I’d love a post on this issue… I’ve been doing very little shopping the last two years after going thru a MASSIVE downsizing in order to move. And it’s time (maybe this summer/pre-fall) to update and upgrade some of my okay but not awesome clothing. And I really need two pair of quality bum flattering, leg lengthening jeans to step up my style.